Ok so the London Marathon is this Sunday and it is time to collect my bib from the expo. But let’s back up one moment and talk taper. SERIOUSLY. Taper is difficult – suddenly you have all this time back on your hands and then I could feel the marathon anxiety coming in. But you know what I did – moved. Nav said move, so I spent my lunch breaks and evenings going on nice long walks. It helps! That said, now back to expo. (I had been before two years ago to see my buddy, Karim, but I had a rough week and was all a bit of a blur). Nerves soon went when I was so lost on the DLR I had to get an Uber rescue from the happiest driver with absolutely no idea how to find the entrance! Lovely guy. First stop to find Karim. Interesting things about this guy – my FIRST running friend. I met him at Ready Set Go run but Nike two years ago, he helps with London Marathon every year and he always spells my name ‘Shopie’. (One day he will surprise me hey..). Meet Karim.. So they say don’t change your outfit. But with the weather said to look very hot the Lululemon worlds thinnest leggings were still going to be a little warm for this one. Of course my top concerns – how would I do without the famous Lulu pockets and the CHAFE! But we will worry about that one tomorrow. Next stop. Waiting for Alex to also fail miserably at the DLR. It was time to collect the bibs! To be honest, it had not even hit me that I was even running London at this point. Even with my bib. 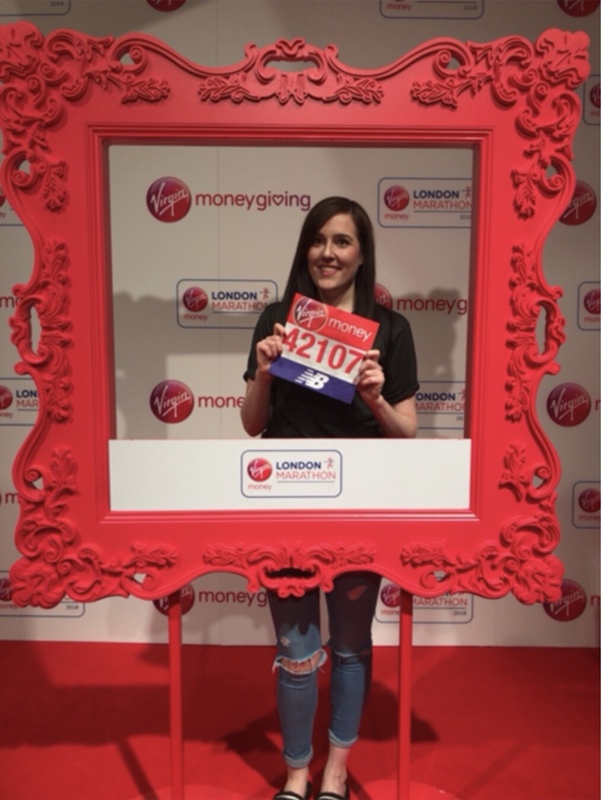 Me – running the LONDON marathon! ?